While there is nothing more enjoyable and lovable than having a pet, there are some challenges along the way which should also be considered. Pet hair is a major problem in most homes, and it could lead to lot of health challenges. Some of the worst forms of bronchial attacks and skin irritations occur because of pet hairs and dust that gets accumulated in the house. To overcome this problem, identifying the right pet hair and dust vacuum cleaner is a must. While there are dozens of vacuum cleaners available in the market, let’s have a closer look at Neato XV-21 Pet & Allergy Automatic Vacuum Cleaner and find out its various features, functions, pros, and cons. We’ll give a verdict about our take on the vacuum at the end. The vacuum is feature rich and has a several advantages and benefits. However, we will have a look at a few major advantages which has caught the attention of many customers. ​1. It has one of the most powerful cleaning systems. Despite this, it’s been designed taking into account the sufferings that pet owners go through from dust, pet hair, and pet dander in the house. Many people also suffer from allergies caused by dust and dirt, and this vacuum is certainly a blessing for all of them. The suction power generated by the powerful motor even picks up hairs embedded into thick carpets. ​2. It’s truly a multi-purpose vacuum cleaner that’s capable of removing dirt and pet hair from almost any surface. Whether there are rugs, carpets, laminate, hardwood, stone or tile floors, customers can be sure that not bit of dirt will be able to escape the brushes of this powerful vacuum cleaner. ​3. It has a unique automatic cleaning system. The schedule and cleaning times can be set by you ahead of time and the machine will do the cleaning while you’re away. When the vacuuming has been completed, the Neato XV-21 Pet & Allergy Automatic Vacuum Cleaner returns to charging mode. For all purposes, it’s an automatic vacuum cleaner. There is no doubt that this vacuum cleaner takes vacuuming to new levels of efficiency. There are many features that are worth mentioning, and here are some of the best:The XV-21 comes with specially designed high-quality bristled brushes. It helps to easily pick up the toughest and deeply entrenched pet hairs, which other machines may not be able to do. The Pet & Allergy Filter helps to boost air flow and when combined with suction power the combination is simply lethal. ​It has an intelligent built-in scanner which identifies the area where dirt and pet hair have accumulated. ​You can set up to 7 automatic cleaning times and the machine does the cleaning efficiently on its own, without you having to remember to turn it on. ​It has special features which help reduce allergens rapidly. The dust bin filling system is efficient and the vacuum uses HEPA filters. The dust collection bin is large enough to fit a full load of dirt from each cleaning. You can empty it after each cleaning cycle and only need to wash it occasionally. ​It has an auto-adjusting feature which is useful when it comes to cleaning soft surfaces like carpets and hard surfaces like stone, or a combination of both. 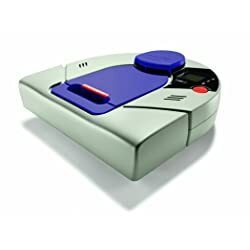 ​It has the unique and patented RPS Technology which uses laser-based vision and room mapping, helping the vacuum clean areas where humans can’t conveniently reach. Every product has its own shortcomings and cannot satisfy customers 100% all the time. The same is the case with Neato XV-21 Pet & Allergy Automatic Vacuum Cleaner, which has some shortcomings according to customers. One of the most common complaints is that the vacuum cleaner needs more regular charging when compared to others in the market. This makes it less convenient for cleaning larger rooms or the whole house. After carefully going through the various features, specifications, pros, and cons, one thing is clear: Though there could be other vacuum cleaners with the same specifications, this particular model scores on a few key areas. These include its intelligent self-cleaning system, efficient dust bin, and its ability to clean almost all surfaces. When taken together, it’s certainly a vacuum cleaner worth considering for homes with pets.